Very rarely does a wine label provide a window into a wineries principles. Bold, modern and true, the foundations of 2 Lads Winery. The second winery featured on my tour of the Old Mission Peninsula, 2 Lads Winery is a modern, contemporary winery with 22 acres of vineyards. Specializing in cool-climate red and sparkling wines, the winery produces a small run of white wines to round out production. 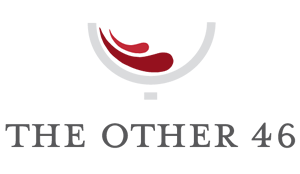 Sustainable farming combined with their hands-off approach to winemaking sets 2 Lads apart from more traditional wineries. 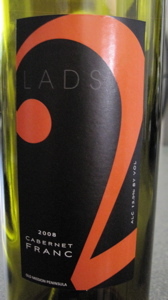 The 2008 2 Lads Cabernet Franc ($25) saw 10 months in “2nd fill” French oak barrels and natural malolactic fermentation. On the nose, aromas of red cherries, cranberries and red currant abound. In the mouth, flavors of plums, raspberries and a touch of nutmeg are on display in the light to medium-bodied wine. Made in a fruit-forward style that more and more winemakers are gravitating towards, especially in Michigan. Cheers! 2Lads is a fave of mine here in Michigan. They are producing some very good wine! Thanks for stopping by for my Michigan series. 2 Lads is an outstanding winery and I look forward to tasting through their entire portfolio of wines. Any favorite variety you recommend to check out from 2 Lads or any other Michigan winery? Cheers!